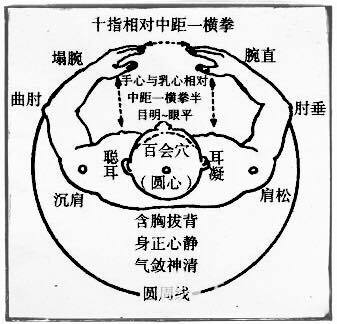 During Standing Pole exercise (Zhan Zhuang) the Bai Hui acupoint (at the top of the head) connects with the heavenly qi; the Yong Quan (at the bottom of the feet) joins with the ground qi; the Lao Gong at the centre of the hands opens up to the body's inherent natural qi. It is said that during Zhan Zhuang the nerves in the knee joints receive strong stimulation that result in the activation of true qi that in time causes the body to warm up and the hands to have the feelings of expansion, numbness and tingling. Negative qi (postural deviation, physical illness, mental stress etc...) is expelled, usually through perspiration. Achieve effective Zhan Zhuang through its root - from the feet. Known as the "second heart" or the “base of jing and qi”, a vast amount of the body's nerves are concentrated in the soles of the feet. It is credited for taking a major part of the body's physical demands. Zhan Zhuang is also an important method by which to open the Hui Yin acupoint (in the perineum) and dredging the meridians. It helps to quick start the body's energetic mechanism and promotes and enhances the circulatory functions of the Du and Ren Meridians and energy flow in the channels and collaterals. The famous Chinese poet and pharmacologist Su Dongpo (1037-1101), evaluated qi cultivation method: "Its effect may not be felt initially, but accumulated over 100 days (over time), its benefits cannot be quantified. Compared to medicine its effect is a hundredfold."